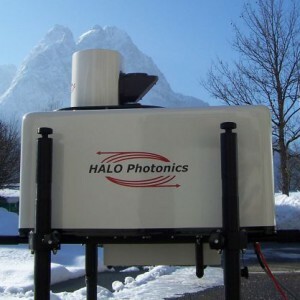 The pulsed „Stream Line“ Doppler Lidar system manufactured by GB based company Halo Photonics is operated at an eye safe wavelength (1.5 µm, class 1M) and delivers profiles of back scatter intensity from aerosol or clouds, Doppler wind components and derived profiles of horizontal wind speed and wind direction. The system offers easy set up and convenient remote control. The unique scanning unit allows complex scan patterns within the whole upper hemisphere. Metek adds a sophisticated routine to derive vertical wind profiles from arbitrary 3D scan patterns and to display the output variables by our Metek Graphics. Outstanding flexibility and proven reliability of the Stream Line Doppler lidar systems of Halo Photonics completed by METEK’s online derivation and visualisation of 3D wind vector profiles and turbulent quantities.